**First Author and Corresponding Author, Zaozhuang University, China. ***Corresponding authors, Shandong University of political science and law, China. Received: Agust 21, 2013. Revised: December 15, 2013. Accepted: January 16, 2014. Purpose - This objective of this study is to analyze the factorsthat impact Chinese consumers` purchasing intent forhigh-tech products. The study examines smart phones’features,Chinese personal consumer characteristics, and social influence. Research design, data, methodology - The study employedsurvey data based on 200 questionnaires in principalChinese cites between October and December 2011. SPSS 17.0was employed to analyze the data used to test the hypothesesthe analysis results confirmed some hypotheses proposed. 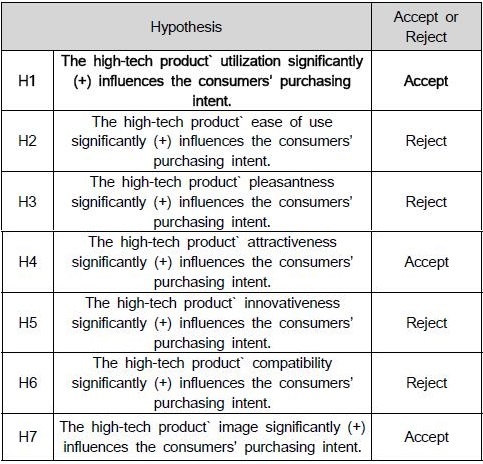 Results - Hypothesis 1, Hypothesis 4, and Hypothesis 7 proposingthat utilization, social image, and attractiveness, respectively,of smart phone elements influence the Chinese consumers`purchasing intent are supported. Conclusions -This study found the factors that impact purchasingintent for high-tech products among Chinese consumers,with some factors like social image, attractiveness, and utilizationplaying critical roles; however, hypotheses proposing factorssuch as ease of use, pleasantness, personal innovativeness,and compatibility were rejected. In future, more researchfocusing on the elements of smart phones is required. JEL Classifications : F31, F47, L83, L88. Key Words : Consumers` Purchasing Intent, High-Tech Product, Smart Phone. According to Product Life Cycle Theory, the sales volume and revenue of a product will certainly be reduced after the product has entered into market for a period of time due to the existing and emerging competing products. Therefore, enterprises should continuously invest efforts in research and development of new products to obtain certain market share for their own operation and growth. Consequently, there always are new products and services flowing into market. However advanced and updated the products may be, to some events they are not accepted by consumers. As such, for those enterprises which obtain low return from launching new products will find development and market introduction of new products cost a lot. R&D cost is especially a huge expenditure for the purpose of rapidly developing technology-intensive high-tech products. This paper will focus on smart phones among high-tech products, and research and analyze the factors that impact consumers’ purchasing of smart phones based on theory research. As at the end of 20th century, accompanying with technology development, high-tech products rapidly diffused all over the world. However there is still no clear definition of high-tech product, industry or enterprise. OECD (Organization for Economic Co-operation and Development) proposed that high-tech industry includes aero space, artificial intelligence, biotechnology, information technology, nanotechnology, defense technology and other industries; while US Bureau of Labor Statistics defines high-tech enterprises as enterprises with the amount of R&D expenditure and the number of professional scientific and technical personnel more than twice of the average level of national manufacturing industry. High-tech circumstance is of competitive volatility. Some enterprises usually underestimate or ignore new competitors before it is too late to be aware of the threat. Therefore it is neces-sary to pay close attention to market changes, confirm the stage of market and keep clear in mind what should be prepared, to achieve success in high-tech product market. Geoffrey Moore is of the view that most of the customers slowly accept high-tech products because they are fear to learn technology, pay additional charges and change their lifestyles, resulting from the determination of specification or the safety of service and technological uncertainty of products. And the doubts on speed, safety and other functions have formed the so called FUD factor. High-tech products or services characterized with discontinuous innovation have difficulties not only in development in primary market but also in transition from primary market to mainstream market. Therefore, for the purpose of high-tech product marketing, it is primary to make sure of the features of acceptors’five stages during the product acceptance period as well as the strategic measures of each stage. The impacts from consumers’ individual resistance to innovation, the safety of high-tech product and social resistance at social standard level also cannot be underestimated. Therefore it is also important to pay close attention to high-tech marketing related laws, systems and technological circumstances. Applying other products after using high-tech products will generally result in lock-in phenomenon. Therefore, lock-in phenomenon is an important factor to be considered for high-tech products marketing. Lock-in phenomenon resulted from network effect. Once a product is applied, consumers will involuntarily regard this product as the "actual standard" and replacement by another product will result in incurrence of physical, economical and psychological "replacement charges". Except for product performance and social impact, perception is also one of the impact factors which should not be ignored. According to Bruce and Whitehead (1988)’s opinion, with marketing experts being the research object, 60% interviewers chose product design to be one of the important success factors among those conditions for new technology’s success. Since 2000, high-tech products extensively diffused. People not only attached great importance to technology but also began to think highly of perceptual properties. Kim (2003) proposed that 1970s-1980s is production era, 1990s is technology era and 2000s is technology & perception era. In addition, during the new products purchasing process, there are five categories of people with different attitudes toward product and product acceptance time, such as innovators, early adopters, early majority, late majority and laggards. Therefore, personalities are also one of the impact factors on purchasing intent. 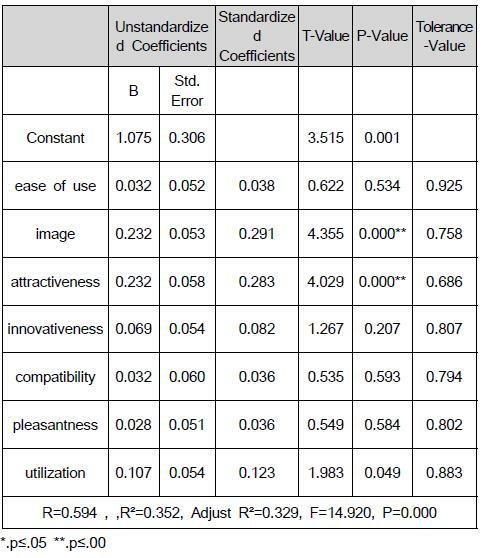 This paper chooses smart phone, the most popular high-tech products among others, as research object to research whether those independent variables such as utilization, ease of use, pleasantness, attractiveness, personal innovativeness, compatibility and social image have any impact on consumers’ purchasing intent and what’s the impact. According to the literature, this research made the questionnaire. The operating definitions of each variable are constructed by 8 variables with 27 items. Through the analysis, the Ease of use of variance with 4 items(Davis, 1989), the Social image of variance with 4 items(Kim, 2008), the Attractiveness of variance with 3 items, the Personal innovativeness of variance with 3 items (Kim, 2007)，the Pleasantness of variance with 4 items(Davis et al., 1992), compatibility, the Compatibility of variance with 4 items(Kim, 2008) and the Compatibility of variance with 4 items(Kim, 2008) are discovered to all have impact on consumers’purchasing. According to the Chinese franchise association, we collected the data from the main cities, Beijing, Shanghai, and Guangzhou in China from 15th Oct. to 15th Dec, 2011. In order to improve the reliability of the data, we depended on the profession research association in China to collect the data from by Questionnaires from 200 Chinese students. Through factor analysis, the seven factors： utilization, ease of use, pleasantness, attractiveness, personal innovativeness, compatibility and social image are discovered to all have impact on consumers’purchasing of smart phones. Through regression analysis, social image, attractiveness, utilization, personal innovativeness, ease of use, compatibility and pleasantness have impact on purchasing intent in this order. Of which social image, attractiveness and utilization are statistically meaningful. First of all, according to factor analysis, elements like utilization, ease of use, pleasantness, personal innovativeness, compatibility, social image and attractiveness, play vital roles in the process of purchasing intent. Second, by means of regression analysis, it is obvious that factors are ranged in an order in which their importance reduces gradually as follows: social image, attractiveness, utilization, personal innovativeness, ease of use, compatibility, pleasantness. In order to test the research model, SPSS17.0 is used to do the path analysis. The research model has good fitness (R=0.594 , ,R²=0.352, Adjust R²=0.329, F=14.920, P=0.000). According to factor analysis, elements like utilization, social image and attractiveness, play vital roles in the process of purchasing intent. This is consistent with the research by Moore & Benbasat (1991),Su (2010), and Ha et al.(2007). However, the hypothesis of high-tech product elements of ease of use, pleasantness, personal innovativeness, compatibility is rejected. It is because the Chinese market is so big and the business environment is complex. According to the different economy, it can be divided into east area and west area. Thus, it is difficult to do franchisor control by one evaluation standardization. There are two causes of reason. One of reason, the Chinese Market is so big and the business environment is complex. According to the different economy, it can be divided into east area and west area. Thus, it is difficult to do franchisor control by one evaluation standardization. Two of reason, there is only 200 students data for analysis, the samples are limited to students due to characteristics of the smart phones, the results may be limited, too. it can`t more explain the hypothesis of reject. The following are the revelations from research: Currently there are not many researches on perceptual factors of high-tech products. Both pleasantness and attractiveness in this research are perceptual factors and are proved through empirical analysis to have impact on consumers’ purchasing intent. Attractiveness is especially statistically meaningful. As a result, research on high-tech products can extend to perception. Most researches that make smart phones as object focus on the characteristics of smart phones. However, this paper replaces smart phones’ characteristics by personal innovativeness to start a research on consumers’ purchasing intent. This dissertation consists of two major points First, since there is little research focusing on this area, this essay contains in-depth study about emotional characteristics such as pleasantness and attractiveness. Second, innovational replaced the traditional functional factors as the starting point of the research. However, since the number of the samples is not sufficient and as a matter of fact, the samples are limited to students aged 10 to 20 and office workers aged 30 due to characteristics of the smart phones, the results may be limited, too. Moreover, this dissertation is mainly focused on smart phones; while other high-tech products should also be included. Last bt not least, early adopters play important roles in the whole diffusion process, hence, marketers can profit from dividing Customers into different levels. 1.Bruce, M., & Whitew, M. (1988). Putting Design into the Picture: the Role of Product Design in Consumer Purchase Behavior. Journal of the Market Research Society, 30(2), 147–162. 2.Geoffrey, M. (1991). Crossing the Chasm: Marketing and Selling High-Tech Products to Mainstream Customers or simply Crossing the Chasm. New York: Harper Collins Publishers. 3.Hackbarth, G., Grover, V., & Yi, M. Y. (2003). Computer Playfulness and Anxiety: Positive and Negative Mediators of the System Experience Effect on Perceived Ease of Use. Information & Management, 40(3), 221-232. 4.Hirschman, E. C. (1982). Symbolism and Technology as Sources for the Generation of Innovation. Advances in Consumer Research, 9, 537-541. 6.Moriarty, R. T., & Kosnik, T. J. (1989). High-Tech Marketing: Concepts, Continuity, and Change. Sloan Management Review, 30 (Summer), 7-17. 7.Su, S. (2010). The Impact of Country Image on the Chinese Consumers' Purchase Intention. Journal of Distribution Science, 8(1), 43-52.